It was in the midst of Spain’s nasty colonial war in Cuba (1868-1878) that New York’s small Spanish colony first proposed to raise money to donate to the city a statue of Miguel de Cervantes, author of Don Quixote de la Mancha. These New York Spaniards hoped that the monument would be placed in Central Park, and that this prominent evocation of the great Spanish –and universal– author would help improve Spain’s image in the city, which, because of the war in Cuba, was at one of its lowest ebbs. When a truce between Spain and Cuba was reached in 1878, the fundraising drive petered out, and the monument was never built. Fast-forward a century. In 1986, Enrique Tierno Galván, Mayor of Madrid, ordered three replicas to be made of the 1835 sculpture of Cervantes created by Antonio Solá, often considered to be Spain’s last great neoclassical sculptor. The original is located outside of headquarters of the Spanish Congress (Palacio de las Cortes) in Madrid. Tierno Galván would eventually present the three replica statues as gifts to the cities of La Paz, Bolivia, Beijing, China, and New York. 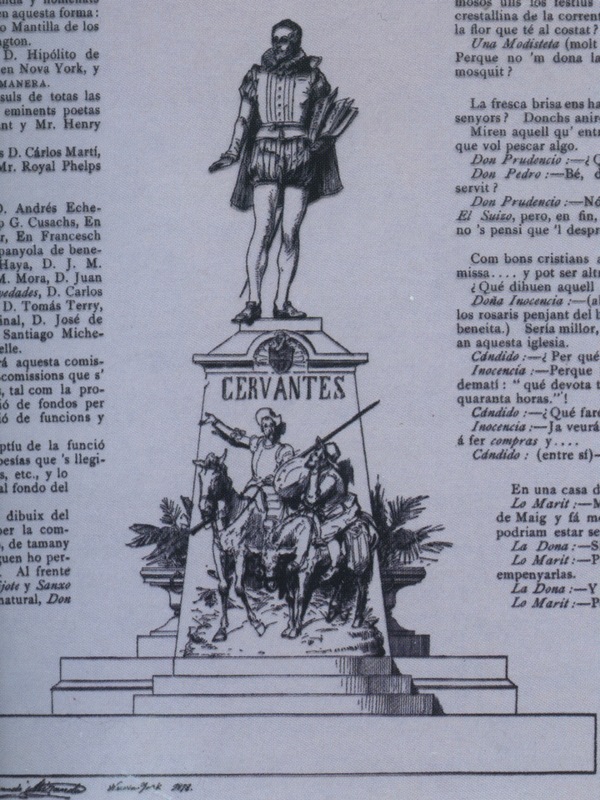 Artistic rendering of the Cervantes sculpture planned in 1874 by the city's Spanish colony. The illustration appears in the first issue of the Catalán publication La Llumanera de Nova York. According to NYC Statues, this gift from the city of Madrid was originally installed in Bryant Park until 1989, when the park underwent a massive restoration project. The statue was then supposed to be relocated to the middle of Washington Square Park, but was deemed too fragile and, according to Gerard R. Wolfe, was thus donated to New York University (Wolfe, 113). 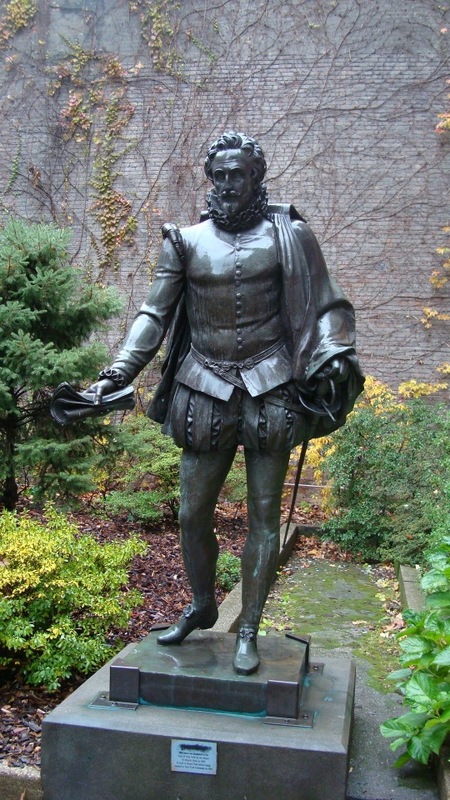 The University decided to place the statue in the charming “Willy’s Garden” –at the end of a courtyard just off Fifth Avenue, between Washington Square North and Washington Mews– where it stands today as a lasting reminder of one of Spain’s great cultural figures, and of the long and checkered history of Spain-US relations. See Wolfe, Gerard R. New York: 15 Walking Tours : an Architectural Guide to the Metropolis. New York: McGraw-Hill, 2003. Print.